Maj. Curtis Daniel Miller, missing in action since 1972, was laid to rest Monday after being identified last year. (CNN) -- Learning that a loved one is missing in action is one of the hardest pieces of news a military family can receive. But after the worst news comes, not having physical remains to bury can be excruciating. For the family of Air Force Maj. Curtis Daniel Miller, missing in action since 1972, that nightmare may finally be over. On Monday, Miller's remains, identified in 2008, were buried in the Dallas-Fort Worth National Cemetery. He received full military honors, including an Air Force flyover. "Thirty-eight long years of not knowing is absolute purgatory," Miller's wife, Susan, said in an interview with CNN affiliate WFAA-TV. "It's something that never ends." "My husband was a hero. He always served people. I am so terribly proud of him ... he gave his last measure for our country," she said. There are more than 1,700 military personnel from the Vietnam War still considered missing in action, according to the Pentagon's Defense Prisoner of War/Missing Personnel Officer unit. Of the 341 Americans still unaccounted for in Laos, where Miller's remains were found, 40 are in a "no further pursuit status," which, according to the missing personnel unit, means "that as a result of rigorous investigation we have conclusive evidence the individual perished, but do not believe it possible to recover his remains." On average, remains of 75 servicemembers from the Vietnam War are found each year, according to the missing personnel unit. The work is done through excavations, interviews on the ground and by analyzing mitochondrial DNA. In that process, the DNA from a mother is used to identify the servicemember. 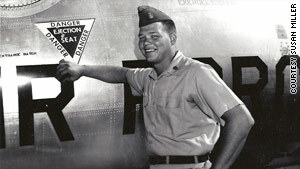 Miller was part of a 14-member crew aboard an AC-130A Spectre gunship that was shot down by a shoulder-to-air missile on March 29, 1972, during an armed reconnaissance mission over southern Laos. Pat Carpenter, who served as a gunner aboard Spectres in the early 1970s, told the Fort Worth Star-Telegram that it was a "pretty hairy time for the gunships. Triple A [anti-aircraft artillery] was a constant threat." According to the missing personnel unit, search and rescue efforts were halted just days after the plane was shot down because of "heavy enemy activity in the area." In 1986, a joint effort by the United States and the Lao People's Democratic Republic, led by the Joint POW/MIA Accounting Command, surveyed and excavated the crash site in Savannakhet province, Laos. "The team recovered human remains and other evidence including two identification tags, life-support items and aircraft wreckage," according to the missing personnel unit. "From 1986 to 1988, the remains were identified as those of nine men from this crew." Between 2005 and 2006, joint teams "resurveyed the crash site and excavated it twice. The teams found more human remains, personal effects and crew-related equipment," the unit said. The long wait for Susan Miller to find her husband was not without an uphill battle. She often traveled to Washington and was heavily involved in the National League of POW/MIA Families, according to media reports. She told the Star-Telegram that while the Air Force had been good to her, "There were times when we thought we were hitting a brick wall. ... It was extremely frustrating." Over the years, family members received piecemeal information. They heard reports that the Air Force had picked up emergency beacons coming from the crash site, a tip that did not pan out. In 1983, the Air Force gave Susan Miller a wedding ring found at the site, with the inscription, "Forever Love Sue." According to a Houston Chronicle story, the 14K gold band was in perfect condition, giving family members hope that Miller was able to flee the burning wreckage. Miller, who grew up in Palacios, Texas, met Susan, then 19, in college and the two married shortly after in 1966, she told the Star-Telegram. In 1969, she gave birth to a daughter. In 1971, Miller deployed to Thailand to serve with the 16th Special Operations Squadron. The missing personnel unit's efforts to find and identify MIAs and POWs span from WWII to the 1991 Gulf War. Its mission, according to the unit, is: "To lead the national effort to prepare our personnel for possible isolation while pursuing U.S. national objectives abroad, establish the most favorable conditions to recover and reintegrate them and fully account for those lost during our nation's past, present and future conflicts." The missing personnel unit's work also means working with the governments of countries where those conflicts took place. In 2000, Congress passed the "Bring Them Home Alive Act," which then-President Bill Clinton signed into law. The act gives refugee status to foreign nationals of specified countries who assist in retuning to U.S. officials a live POW or MIA from the Vietnam or Korean wars, the missing personnel unit said. Congress in 2002 passed the "Persian Gulf War of POW/MIA Accountability Act," which grants the same refugee status to those from that war zone.